The first track of the legendary punk band’s new album is aptly titled “Back Where I Belong,” a fast, raging anthem that feels like diving headfirst into a pool of freezing cold water, and a testament to Rancid’s comeback after their last two more pop-friendly albums. Fans will be happy to know the punk has not been lost, and that Tim Armstrong and the rest of the band are getting back in touch with their roots. The title track keeps the heartbeat racing feeling going with high, squealing guitar riffs and a drum beat that sounds like what a shot of adrenaline straight into the bloodstream would feel like. Armstrong’s distinct lead vocals power through the noise with their signature guttural growl, but it’s clear as the tracks keep going that it’s not as fluid as it used to be; he’s pushing his limits, and raw and edgy soon becomes tired and strenuous. Rancid has mastered the art of the perfect live show track with “Face Up,” as a chanting chorus features a call and response section that fans are sure to eat up at the next concert, and even shout out at home when they think no one’s around to listen. The track following immediately after, “Already Dead,” takes on a darker tone, with Armstrong spouting out angry lyrics over rapid fire drumming and guitar strumming, highlighting the union between past Rancid and future Rancid. Overall, the album still has a cleaner sound than the punk rock band’s early work, but there’s rougher edges on this one than were heard on Indestructible and Let the Dominoes Fall. 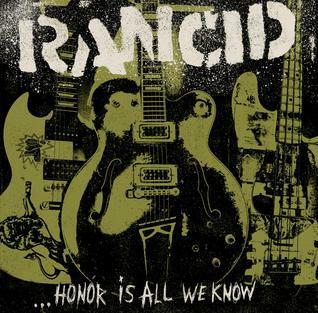 Honor Is All We Know may not be the full return of Rancid’s punk power, but it’s a step in the right direction.